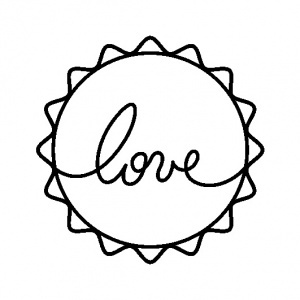 Beautiful cute acrylic stamp, measuring approx. 3.5cm diameter and featuring the word 'love' in a handwritten stye. The set comes with a clear acrylic block measuring 5 x 5cm. Simply attach the stamp to the block and it sticks by itself. When you've finished with it, peel the stamp off and the block can be used with other clear stamps. The clear stamp and block means it's a breeze to stamp it exactly where you need it.